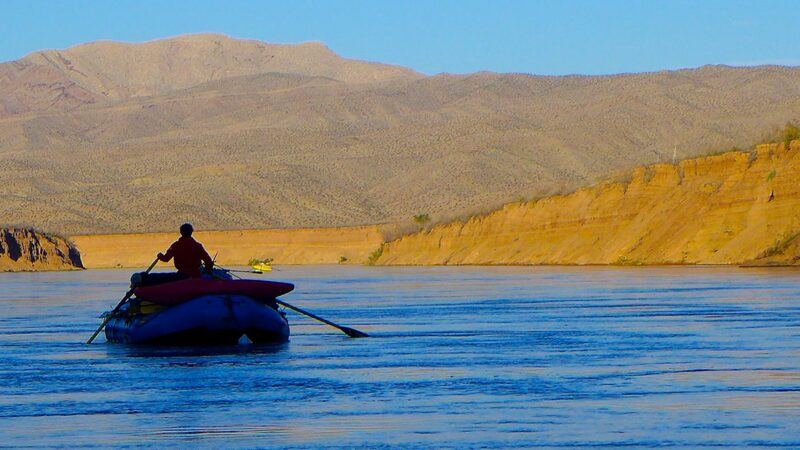 A boater coming out of the Grand Canyon on the Colorado River into a retreating Lake Mead. The silt walls on either side of the river reveal that Lake Mead has been falling steadily since a 19-year drought started in 2000. WESTMINSTER —The Bureau of Reclamation’s regional director of the Lower Colorado River Basin last week gave the Colorado Water Congress a timely update on drought-contingency planning. Terry Fulp, who oversees Lake Mead, is the federal government’s point person on gaining approval of a set of drought-contingency planning (DCP) agreements in the lower-basin states of Arizona, California and Nevada. Fulp spoke to the water congress Feb. 1 in the Denver suburb. A day earlier, Arizona Gov. Doug Ducey signed legislation required for that state to move forward with DCP. In doing so, Ducey barely made the Jan. 31 deadline set by Fulp’s boss, Reclamation commissioner Brenda Burman, for the agreements to be signed. Fulp said there are still a lot of “underlying agreements” that have to be finished. Still, the Jan. 31 deadline was missed by the lower-basin states, and Burman duly published a notice in the federal register Feb. 1, giving the states until March 4 to submit proposals on how to complete the deal. If that new deadline is met, the commissioner will rescind the notice in the federal register. In December, the Upper Colorado River Commission, in a vote of its representatives from Colorado, Utah, Wyoming and New Mexico, approved the DCP agreements pertaining to the upper basin. But those agreements don’t take effect unless the lower-basin DCP agreements also are signed, and the whole deal is then blessed by an act of Congress. For the water sector in Colorado, the DCP approval process counts as high drama. Noting the recently fallen snow in Westminster, Fulp used a skiing analogy to describe the status of the DCP process. (Here are the draft DCP agreements, as of Dec. 12: the drought response agreement on upper basin reservoir releases; the agreement on demand management storage in Lake Powell; a “companion agreement” linking the upper and lower basin agreements; the lower basin drought contingency plan agreement; and Exhibit 1 to that agreement). Fulp also explained why the lower basin DCP agreements were necessary, starting with a photo of Lake Powell when it was last full, in early 2000. The guidelines, signed in 2007, were designed to balance the water levels in Lake Powell and Lake Mead and to manage the shortages in Lake Mead if the reservoirs kept falling. And they have — and more than expected, with 2011 being the only really wet year in the Colorado River basin since 2000. Fulp said the interim guidelines, even under their strictest conditions, would still leave the lower basin 600,000 acre-feet short of water each year. But under DCP, water users in Arizona, California and Nevada will leave much more water in Lake Mead. However, Fulp said even the DCP agreements might not be enough to keep Lake Mead operating in the face of continued dry conditions. Also, he noted that the federal government is not driving the DCP deal. Still, if the states can’t get the deal done, the feds say they will mandate any water-use cutbacks they deem fit. Editor’s note: Aspen Journalism collaborates on coverage of rivers and water with The Aspen Times and other Swift Communications newspapers. The Times published this article in its print edition on Saturday, Feb. 9, 2018, as did the Glenwood Springs Post Independent.